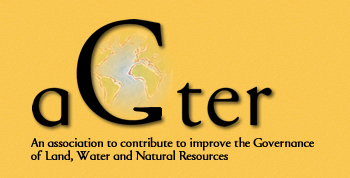 AGTER organizes meetings periodically to allow the members of the network to discuss central issues linked with the governance of land, natural resources and water. These meetings are open to the public. People interested by a meeting must contact previously the AGTER’s team to enrol. These meetings start with a conference or a round table and end by questions and a debate. Meaningful excerpts of these meetings are on line (video) on this website, as well as some support documents (slides or papers, when available).